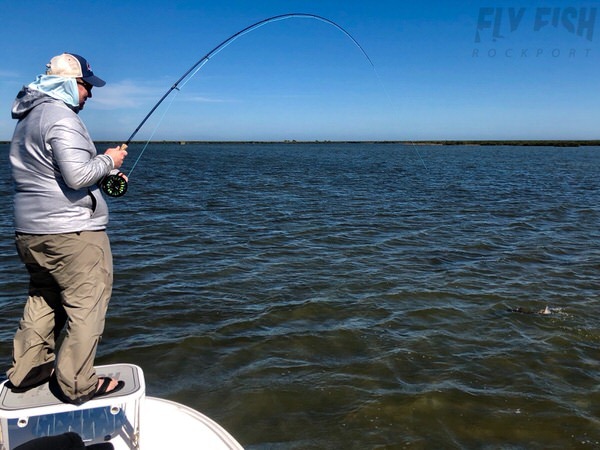 February is here, and finally another fishing report for Rockport, Texas and the surrounding waters. We have been slacking like crazy around here on the web type stuff. Very sorry for that. Instead of keeping our fishing reports and social media stuff cranking in high gear, we have opted for writing code and working on a bunch of more in depth web type projects. YUCK!!! But, alas, we are back and here to update you on what we are seeing out there on the Texas flats. Since our last report, way too long ago, things have actually remained pretty consistent. Winter finally set in on us a little bit. Not that it has been that cold really. But we have had our share of weather. For the past few weeks, we’ve had plenty of wind, cold and rain around here. But mixed in, we will get two or three decent days out there as well. So we have been trying to make the most of those. Today was a good example. We had rain all day yesterday, and heavy winds the days prior to that. So today it was good to be able to get out again with light winds and fairly bright skies. Even with the rain and junk, the temps have remained pretty warm. This means, our water is in pretty good shape as well. At least the past few days. The weeks prior have been a little tougher. But the past few days, the temps have been in the upper 50’s most days, which is good for our Winter fishing. On the days we could get out this past week, it has been pretty good. Early in the week the tides were pretty low around here. That actually made for some pretty fun fishing. There were a good number of schools around in the mornings. Most in the 5-10 fish range. The schooling fish were a bit on the smaller size, as you might expect. But it was kinda fun to see a bunch of fish moving around together. As the day would go on, and sun got higher, the fish would spread out more. Also, it was a bit easier to find some better fish moving around. Most were swimming solo. Although there were a few flats that had paired up fish moving around. On the windier days, it was pretty easy to find tailing fish working against the wind. Again, most were either singles or in pairs. But all were plenty happy digging in the grass and working against a fairly stout wind. Today happened to fish really well in the morning. There were good numbers of fish moving around right out of the gate today. Many of these fish early were tailing in some real shallow water. Or you could see them pushing, or their backs out of the water. Made them easy enough to find. Catching wasn’t too shabby either. The water was up a bit more today than it had been in the past week. So we were back to a weighted crab pattern all day. Both our black/purple and blue crab were eaten quite easily. On some of the shallower days, we were throwing a lightly weighted Swamp Thing or Marty McFly a bunch. When the wind got up, it was back to the crab again most days. But getting the fish to eat hasn’t been much of a problem lately, if you get it to them. Aside from reds, there are a ton of black drum moving around. In the right zones, it’s not uncommon to see hundreds of them swim by throughout the course of your day. Most are schooled up and moving pretty quickly. This doesn’t make them too easy to catch. But every so often one will slow down and take your fly. But quite often, there would be a red or two following the school of drum around as they run up the edge of a flat. These will absolutely take a fly, if you can get it down to them in time. Most of this is happening right along the edges of the flats we have been fishing. So you will want to make sure you have a fly that gets down quick in that 2-3 feet of water. This morning we also had quite a few trout moving around. Most were on the smaller end and thrashing around at the surface over some very shallow oyster shell. If you could get a topwater within reach of them, they would chase it down and crush it. Kind of fun, first thing in the morning. But we lost interest pretty quick as most were in that 14-20″ range. But this is the time of year where you might happen upon that larger trout laid up further back in some of these flats. Something to keep in mind. Our weather for the weekend looks like much more of the same. Light winds, mostly cloudy skies and fairly warm temps. With the temps gradually warming, and the calmer winds, you can bank on some fairly foggy mornings and damp air out there. But these mornings actually aren’t too bad for seeing fish, so long as the wind is down. So we are able to get out on the water for the next handful of days. Hopefully we see a bit more sun than they are predicting, but we will take the lower winds any day and be plenty content with that. Hopefully this is the beginning of the end for our Winter down here. Although it may be a little bit early to be declaring that. Mid February usually marks the beginning of our warming trends towards Spring. So if it happened a bit earlier around here, we wouldn’t have any problem with that. The fishing is pretty decent down here right now though. And if we can get the sun to come out for a few days, we would expect it to get much better. But all in all, we can’t complain about things for this time of year. If you are looking to get out on the water, you can always contact us any time if you would like to BOOK A TRIP or need any up to the minute Southwest Texas fly fishing or Rockport fishing type news. We continue to post on Instagram, Facebook, Twitter and Snapchat. Or perhaps SUBSCRIBE to our YouTube Channel as well. We continually are trying to add more videos and stuff there. We try to keep stuff fresh for those of you that are wishing you were on the flats with us. So be sure to follow us on all our social media stuff. And don’t forget to sign up for our monthly newsletter below.